Our work for the UK division of the world’s 14th-largest employer improved search visibility by 638% and saw us nominated for the Northern Digital Awards 2018 award for Best Website. Sodexo is a multinational company providing a wide range of quality of life services, including employee benefits, incentive and rewards, and consumer promotions and loyalty through its benefits and rewards division. In the UK, this side of their business has grown organically through a number of expansions and purchases of other companies, including Motivcom, and its divisions P&MM, AYMTM, and Allsave. In turn, P&MM had a number of sub-brands, including Filmology, Fotorama, and Protravel, which as of 2016 were all considered part of the Sodexo Family. Sound confusing? Well, Sodexo agreed – and in 2017, they decided it was time for a clean slate. We had worked extensively with P&MM on design, development, marketing and ecommerce projects on different sites for a number of years, so they came to us for help. Sodexo had 15 websites covering their employee benefits, incentive and recognition, and consumer promotions and loyalty services. From now on, they wanted one main port of call for all of their products, services, and marketing activity. So, that’s what they asked us for. The branding was completed by a third-party agency. The theme of Sodexo as a leading light in engagement was very strong, and each of their three offerings had unique branding around this theme. Employee benefits was named Glow, incentive and recognition was named Shine, and consumer promotions and loyalty was called Neon. The website needed to consolidate all of their product and service information – as well as all of their web traffic. From planning to completion, the project took six months, and is by far the biggest we have undertaken as an agency. Here’s how we did it. The first step was to determine what the website actually needed to do. No small task when you consider the undertaking – 15 websites-worth of information, features and functionality that all needed to be condensed into one. We began by auditing all 15 sites to get a feel for exactly what was featured, and nailed down exactly what the site would need to do to offer a similar – but better! – proposition for users. The specific requirements of individual areas did evolve as the project developed, but the very core of what the site needed to do from a company, sales and lead gen perspective was set in stone, and it was essential to get this locked down right from the start. The second step (well, actually, the other first step – they happened at the same time) was to develop a visual identity for the website. Both of our designers took the information from the branding agency and worked on initial concepts for the home page. One took a more traditional approach, with a horizontal navigation at the top of the page, while one utilised an always-visible sidebar menu – which ultimately proved to be the most popular. We were keen to use a lot of different visual elements to bring everything to life. Bold sliders, expanding sections, and subtle animations, along with plenty of big images, kept everything sectioned off and easy to read. The final home page is actually quite minimal, focusing on giving visitors to the site a number of different options in how they want to continue their journey – essential with the amount that’s going on underneath the surface! Speaking of which, one of the biggest jobs was making sense of everything already out there on the internet with Sodexo’s name on it, and working out how that would be best represented on the new site. We’d already done this at a top level for the website requirements, but when it came to the copy, it needed a closer look. Sodexo had helped with this – they’d spent no small amount of time developing their new, consolidated product portfolio internally, and were able to give us a lot of direction on what they wanted to focus on, and what they didn’t want to talk about quite as much anymore. One initial bump in the road came when we considered SEO. When undertaking the keyword research, our marketing manager identified a number of keywords that Sodexo ranked very well for – but the new product portfolio set-up didn’t allow for pages on them anymore. Finding the balance between what was best for the site’s search rankings and how Sodexo wanted to sell their services was essential, and we made sure that anything that we couldn’t afford to lose had dedicated landing pages outside of the main product structure. Turning the product structure into a sitemap went through a few iterations – although each of the three offerings work very independently of each other, there’s a lot of crossover in the actual products and services themselves. Two of the three teams sell gift cards, for example – but they’re used for very different things by each of the team’s customers. Cinema was a particularly complicated area. Sodexo run a number of cinema services under the name Filmology, and they touch every area of the business. Ultimately, it was decided that the Filmology brand would remain intact with its own site, with each area of the Sodexo site directing users there when it was clear they needed that separate team’s specific expertise. Again, finding the balance – this time not just between sales needs and SEO, but also site usability (when you search for gift cards, or cinema products, which page do you click on?) was a challenge, but we were able to work closely with everyone at Sodexo to find a solution that worked for everyone, and provided a user journey that would make sense to both new and legacy customers. How were people going to use this website? Well, it’s a good question. And we spared no effort in working out how it might be used. Developing customer personas and considering how they would want to progress through a buyer’s journey with Sodexo’s product structure in mind was the first step, but we also spent a great deal of time looking at how the 15 existing sites operated too. This meant digging down into the analytics of every site we could, working out where people were coming from and where they were going, how long they were staying on pages, and how often they were coming back. We also used heatmap tracking on key areas of the sites with the highest traffic to get a sense of how Sodexo’s customers were using their sites – what they were clicking on, what they wanted to read, and what features they were interacting with. This really helped to inform the user journey from a design perspective, as well as from a copy perspective. 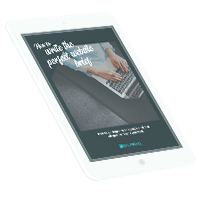 Copywriting started very early in the process – partially to help guide the site design, but also due to the incredibly high volume of pages (final count: 130) that would be needed to cover the entire product portfolio. Our copy team are usually able to research just about anything we cover and become experts in a couple of days – but Sodexo’s portfolio is so far-reaching, involved, and depending on so many closely-guarded industry secrets that we knew we’d need a great deal of input from their product teams. On top of this, the website copy would also be forming the basis of printed sales collateral that Sodexo’s sales team would be using after the product launch, some of which was being written by us, and some of which was being written internally. There were hard print deadlines to get everything done in time for the launch of the rebrand, which meant careful planning and a structured sign-off procedure. As part of the rebrand, Sodexo had developed unique voices for each of their three offerings – each had its own personality and tone of voice. Although the branding agency had made some suggestions, there was a lot of fleshing out to be done. Ultimately, Sodexo’s content and brand team came up to our offices where we workshopped the initial offering copy together to make sure it was absolutely perfect – and sat properly with the way the sales teams actually spoke about the products to clients. Once this was nailed down, we just sat down and wrote it. We were able to get great feedback from sales and marketing teams, helping Sodexo to find their new voice(s) very organically. Before we started on the internal page designs in earnest, we did extensive wireframing to help give a sense of how content would be laid out on the page, and how users would move from one area to another. Sodexo were keen to have a number of different ways to move through the site, – users could explore via products or, more importantly, the outcome they wanted to achieve regardless of the product they used – and we’d identified more options as part of our user journey mapping, so getting the hierarchy of the page layouts right was essential at this stage. 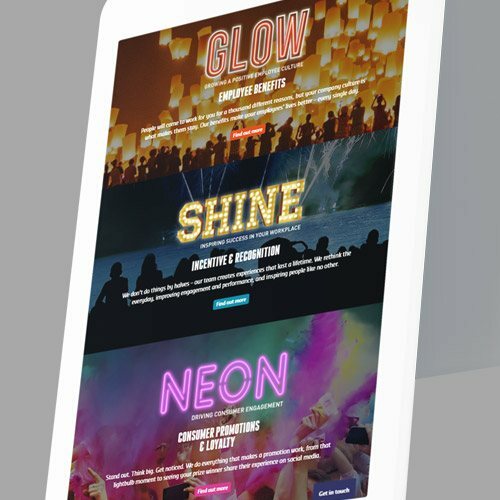 With the amount of information that needed to be pulled together onto the new site, we knew from the start that there’d be quite a lot of content required to adequately tell the whole story – and as we started to write the copy, it became clear that there’d be even more than we’d anticipated in places. In many areas, cutting down on copy wasn’t always an option – Sodexo had a whole new proposition, and at times it needed some explaining. So, we wanted to give the site copy plenty of room to breathe. As we delved deeper into the site, including product and service pages, we used plenty of white space, bold headers, descriptive icons, and interactive elements to break up the copy and make it easily digestible. Making sure there were plenty of CTAs to assist lead-gen was essential here, too. On the surface, it looks quite simple – but there are plenty of unique little touches that bring pages to life. When we’d built sites for P&MM in the past, we’d used WordPress, as we do for the majority of our builds. However, for a number of their marketing activities, we’d been using HubSpot’s automation and lead generation tools, and Sodexo were keen to incorporate some of those tools into the new site. 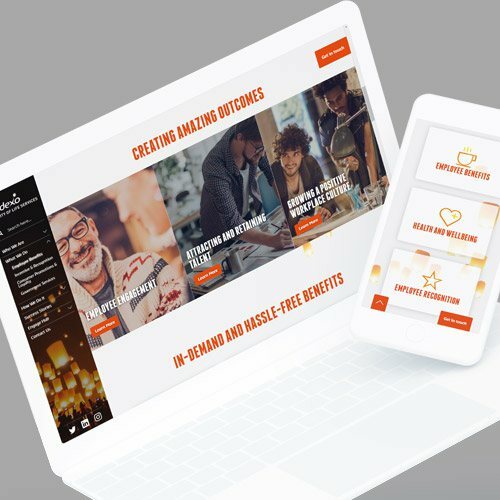 However, they ultimately left the choice of platform up to us – whatever we felt would be best for building the site that we’d designed and they’d approved. Our lead developer undertook a great deal of research into both platforms to compare both on a point-by-point basis, really pushing the features of both platforms to their limits. In the end, we settled on WordPress for the main site – its open-source nature meant we were able to fulfil more of the unique design features through plugins and bespoke code. But Sodexo’s sales team were keen for more lead gen functionality, so we decided on HubSpot to host the blog and gated content. The only problem? These two rival platforms don’t always work together very well. There’s plenty of ways to incorporate HubSpot forms and CTAs in WordPress, for example, but when it comes to actually building sites using elements from both, they’re like apples and oranges. It meant plenty to work out in the build – but that’s no problem! Underneath the hood, the website build used a lot of different features to make such a large site, with a really diverse range of products and purposes, work the way it needed to. Parallax scrolling, animation, sliders, forms, custom searches, and custom post types are used across the board, with a large range of individual templates used to make sure everything is easy to update without losing any flexibility. Everything is fully editable by Sodexo through the CMS – so making sure some of the larger pages were easy to understand in the back end was a big consideration. Everything’s clearly labelled, logically organised, and easy to use, and the clients are very happy with it. Pages can have specific features turned on and off, and can be expanded or contracted to suit the amount of content with ease. Everything’s fully responsive, of course, and works nicely on mobile. The biggest challenge was getting HubSpot and WordPress to talk to each other. There were issues with dynamically pulling the latest HubSpot blog posts through to the product pages of the WordPress site as a result. To avoid Sodexo having to manually update every page when they posted a new blog, we wrote a custom script to generate an XML file of the latest posts, which fed into WordPress to pull in latest stories, based on HubSpot tags that were set up to match each product page. HubSpot also does not contain its own search function. It uses a Google search, which takes you to a new tab with a Google SERP – which includes paid ads from competitors. Obviously, this disrupts the user journey, and could divert users away from the site – so we built a custom HubSpot search from scratch. When you click on the blog, you’d be hard-pressed to tell you’ve moved to another platform. The whole experience is seamless for the users, and for Sodexo’s content teams. Speaking of the blog – Sodexo’s various sub-brands have kept up some very active blogging presences over the past decade, leading to more than 1,800 blog posts and dozens of assets over 12 different blogs. Blogs are essential for SEO, and we didn’t want to lose any that had great traffic – or essential content that we could improve the traffic for. So, we had to read them all. Fortunately, we’d already written plenty of them ourselves, which made the job a bit quicker! Using analytics data to identify the best-performing blogs, we identified blogs we could transfer directly, ones that needed improving, and ones that needed to be banished to the corners of Wayback Machine. We identified around 200 that were worth transferring over (a lot of similar ground had been covered across the dozen sites over the years, so plenty were fine to lose! ), tweaked them to fit the new tone of voice, redesigned infographics and assets, and added them to the HubSpot blog. The Filmology Vouchers ecommerce site was already managed by us, so reskinning it to match the new brand, integrating certain features into the new site, and adding adequate signposts for users was a fairly straightforward job. But we thought we’d mention it anyway, because we love working with the Filmology team, and have been for the better part of a decade now! We already managed a number of Sodexo’s social media accounts, so we were asked to support on their teaser campaign prior to the launch the new brand. Using the hashtag #LeadingLight, we teased the new visuals and offering names, eventually directed people towards the new @SodexoEngage account, and launched the new site. Over the years, Sodexo had (with our help at times!) built up a large library of ebook resources, which they used as gated content for lead generation. Again, these had to be reviewed and rebranded, with new landing pages designed, and new workflow emails written – a job that was shared between us and the Sodexo lead gen team. With the new site ready to go, and 15 old sites ready to disappear, we had to make sure people who were used to the old sites could find exactly what they were looking for in the new product structure. That meant redirects – 8,500 of them, in fact. Every product page, category and blog had to go somewhere new, and this was considered incredibly closely by our SEO team to ensure the best-possible user journey. The final touch to any project. Desktop, mobile, tablet, all the browsers (including Internet Explorer) – the standard drill. The site actually had two launches – the first was an internal launch for Sodexo staff on 4 July. They were able to help out with the testing, and provide any last bits of feedback on copy and design. The final launch was 15 August 2017, after the final bits of HubSpot integration and content population had been finished, with a schedule for taking the old sites down in the few days that followed in place. After months of work and planning, thousands of words, and endless lines of code, it’s job done. Time for a pint! We have continued to work closely with Sodexo in the months since launch, both on ongoing maintenance of the new Sodexo Engage and Filmology sites, and on their SEO and PPC activity. We also created the design and front-end build ecommerce website for Sodexo’s gift card and voucher offering so customers can order them directly online – something they’ve never offered before. All in all, it’s been a fantastic experience for us that’s really pushed the limits of what we’re able to do with both WordPress and HubSpot, and it’s been amazing to get so involved in a really exciting time for Sodexo as a business. We hope they’re happy with their new site – we know we are!